Dexterity is an extremely important feature in a touring glove, however dexterity does you no good if your fingers are cold and you can’t move them. 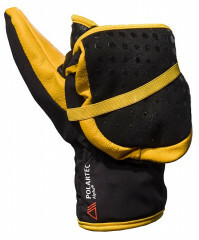 La Sportiva decided to take matters into their own warm hands and craft a mitten to give you the best of both worlds. The lightly insulated finger pocket of the Skimo Mitten flips up and over the backside of your hand to vent heat or momentarily expose your digits for a quick transition. Mittens are inherently warmer than gloves because of the large air pocket that houses all of your fingers, but they are tricky when it comes to ripping skins, adjusting zippers and buckles, or fixing crampons. The convertible La Sportiva Skimo Mitten will let you float in the moat between dexterity and warmth. Elastic bungee keeps the finger pocket out of the way when not in use. Polartec Alpha Insulation is warm and still functional when wet. Suede palm and silicone grippers are durable and grippy. 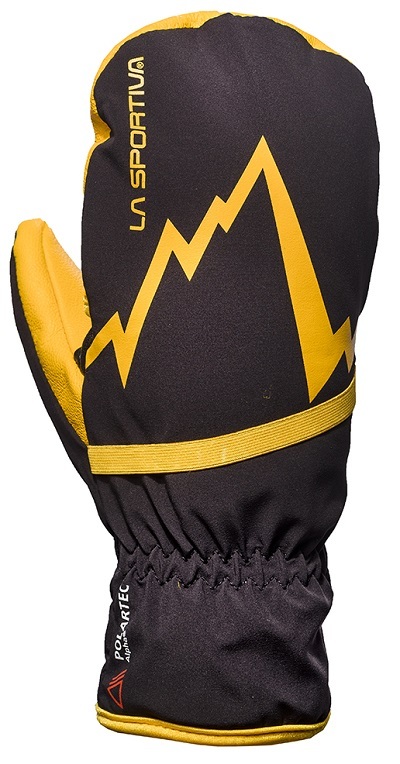 Designed for use with or without a light glove. Notes Suede on palm helps with durability and grip. Bottom Line Warm or dexterous, your choice. I have both this and the very similar La Sportiva Race Overglove. Personally, I prefer the Overglove, since I love the dexterity of gloves even just while skinning and not actually engaging in any dexterous tasks. However, if you're more into wearing mittens in general yet occasionally want to allow your fingers access outside the mittens, the you'll probably prefer the Skimo Mitten since it's closer to being a standalone mitten. The sizing also reflects that, since in the same size Medium the Overglove is significantly larger than the Mitten: I suspect that's because the Overglove is intended to be more frequently flipped over, and also intended to be worn over heavier gloves. 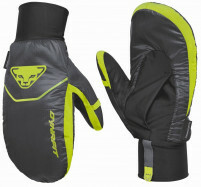 By contrast, the Mitten seems more intended to be worn over thinner gloves with only occasional exposure of the gloves. However, that might be reading too much into the sizing differential and the otherwise small differentiation among these two excellent products.